Well the amazing food is my number one reason. Who doesn’t love great food? I know I do. The thought has my mouth watering. The next and easy yes for you should be absolutely amazing wine. Small destination weddings are less stressful. Looking for wedding destinations in Italy or are you just a sheer romantic when it comes to views over looking nature? Think Tuscany. Oh yes! One of our 20 Luxury Wedding Venues in Italy has to be Tuscany! It is known for it’s gorgeous vineyards and medieval towns. Because of all it’s historical nature, it is an amazing town filled with a lot of medieval elements and castles. This feature alone makes this the perfect place for anyone to pick Italy for their destination wedding. 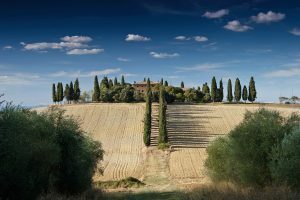 Tuscany is one of the richest parts of Italy as it is known for it’s wealth, art and architecture as well as its rolling green, grassy hills. Do you need to find activities and plan what to do while your there? View this link for a huge list of interesting things to do, to suit all types of tastes. With so many small wedding venues in Italy, let’s look at which location should you pick out in Tuscany? How about somewhere over the Chianti Hills of Tuscany? Wedding ceremonies and receptions that take place in the Chianti hills of Tuscany are completely gorgeous and it is reason enough to book it for your chic wedding in Italy. 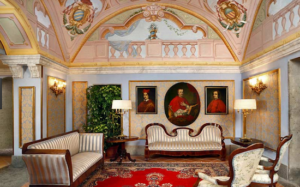 Below, I have picked a 5 star luxury hotel in the Palazzo Gori Pannilini. 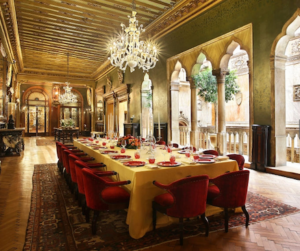 It’s an outstanding ostentatious beauty, the interiors are perfect for the ultimate luxury Italian wedding as the entire building oozes historical excellence, charm and delivers superior experiences every time you turn a corner. Next we travel to Puglia for Luxury Wedding Venues in Italy. Let’s dive right into the Masseria Salamina for our wedding venue. This stunning castle is to die for. If you are planning a small intimate wedding with around 20 – 30 guests than this is the perfect little wedding venue for you. The Masseria Salamina is located a few kilometres from gorgeous beaches and its olive trees make it the perfect location to host your next wedding. Want to be able to taste Puglia cuisine? Then you have come to the perfect place as this area makes amazing food that will have your mouth watering. Need a list of things to do while out there? Visit here and hit the translate to English button! Next in our list of 20 luxury wedding venues, If you are a bride looking for a fairy-tale wedding in a castle like every other princess, then you have found your ideal wedding venue below. Castle Castello Di Vincigliata is above. This popular venue caters to small and intimate weddings. When in Italy I’m sure you know just how amazing the food is. The food at this venue lives up to its name and provides one the best of dishes known in Italy. The venue is literally a castle and we know that Italy is full of castles. The venue has the ability to host the event out doors which allows you to enjoy the beautiful Italian skies, rain free of course. With Florence being a mere 25 minutes drive you will want to make sure that you take time out and visit! As we promised, Italy is the ideal place for you to host your luxury wedding reception with all its amazing views, great landscapes and again- more AMAZING food. So book your wedding right now! 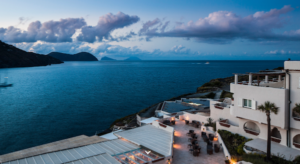 Our next love affair is in Sicily and if you are looking for more of a modern experience, look no further – the venue is the incredible Therasia Resort. It is located on its very own island, surrounded by volcanoes and sparkling green and blue coloured sea, this place is a hidden paradise. Why is the perfect place to host a wedding? Your guests will love its jaw dropping scenic view and look out into the distance and at those rolling hills and just sigh. Picture the sun rising from over the Mediterranean and setting back down behind a landscape of mountains, unforgettable skies bursting with colourful clouds. To top it all off you get to spoil yourself with the height of modern glamour? What more can you ask for? To find out more, visit here. 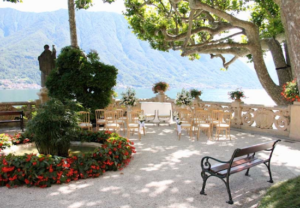 Why not consider getting married in Luxury Wedding Venues in Italy? 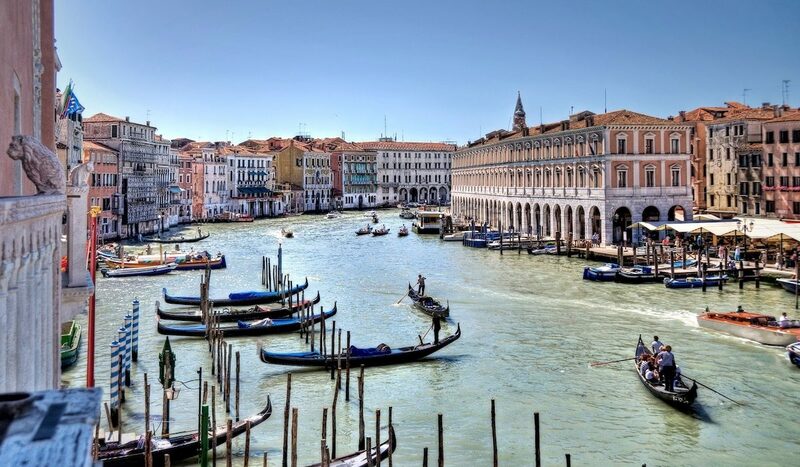 Who hasn’t dreamt of riding the gondola along the Grand Canal? Remember that the city of Venice was built on water. What better way to wow your wedding guest than in this beautiful city? 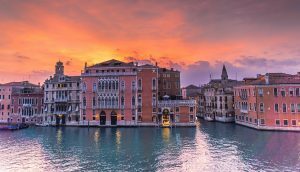 The city of Venice is extremely famous for its Luxury Wedding Venues in Italy with sumptuous hotels and private renaissance palaces which most couples are able to rent and use as private wedding venues. 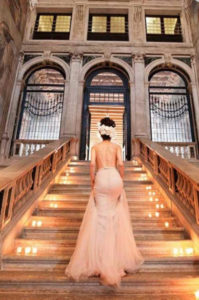 Have you ever wanted to explore Venice as one of your 20 Luxury Wedding Venues in Italy? This renowned city is a marvel and if you chose this luxurious destination for your wedding you need to be fully prepared with a checklist of all the places to see, visit here to make sure you are not missing out! Why not stay in the a hotel with extraordinary, world class hotel, because nothing but the best is what you are looking for! So what venue will we pick out for you in Venice today? Think classy and elegant hotels. 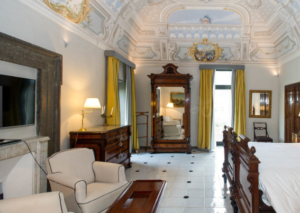 This time we take you to the Hotel Denieli located in Venice. Remember that Venice is extremely popular for weddings so we suggest booking way in advance. The banquet hall below has a maximum capacity of 160. 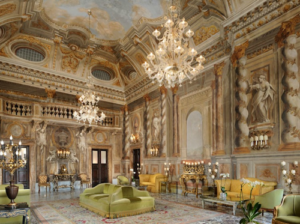 Hotel Denieli is such an opulently furnished Italian mansion, that it deserves an equally regal wedding stationery suite from Crimson Letters. Hand Painted Wedding Invitations, inspired elegant leaf prints exquisitely teamed with brooding blacks, sumptuous purples and rich greens make the Baroque Splendour collection the ultimate indulgence. Enhanced further with flashes of regal gold, this collection is the perfect choice for your sumptuous Luxury Italian wedding venue. TIME FOR A LARGE DRUMROLL…………………………….. If nothing short of a royal palace floating on the canal and the air of the aristocratic-royalty is a must for you, then this breathtaking Luxury Italian wedding venue ticks all the boxes. Nothing comes close to the sheer magnificence and drama this venue commands. 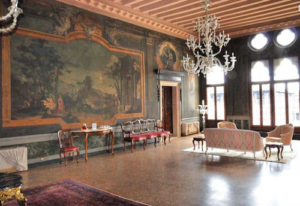 The Ca Sagredo Palace is a spectacular testament to time, boasting some impressive works of art with Venetian painters fro the 17th and 18th century, from large handing tapestries, elaborate architecture, tall vaulted ceilings, statues, well…..really this should be a museum! Many rooms have a view of the grand canal outside. Banquet facilities up to 150. 42 spacious rooms and suites that are decorated fit for a king and queen! 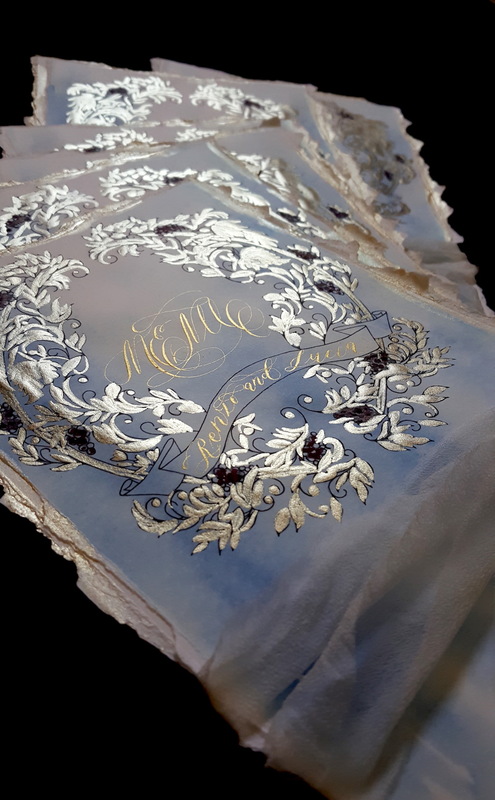 Below, these immaculate Italian themed wedding invitations designed by Crimson Letters would be the perfect stationery for any luxury wedding venue. View the full collection here. Next we travel to Sorrento! This beautiful city has the most amazing views of the Bay of Naples. 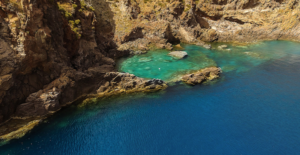 Want a chance to explore the beautiful Amalfi Coast? Then Sorrento is exactly where you need to be. Your guests will absolutely love it and have the ability to visit the ancient towns of Pompeii and Herculaneum. Time will seem to stand still and you can throw away your worries and soak in the romance lavish floral displays. the walls that hold this grand hotel once where a Roma Villa, dating back 1,500 years ago before it was turned into a hotel. A renovators dream! Stay below at the 5 star Grand Hotel of Cocumella. A refuge over time for a collection of artists, men of science and noblemen, this hotel is steeped in rich history. One of the first to have a Robata Grill with a Japanese chef, so you can enjoy oriental dishes for some variation! 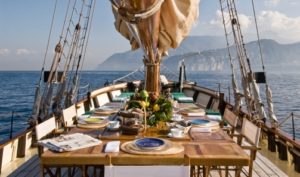 For the price of 2000 Euros you can hire a boat and sail around the Bay of Naples with lunch provided, what could be better then that! Banquet capacity 250, as well as outdoor dining capabilities. 48 suites, with a sleeping capacity of up to 100. Ever thought of hosting your wedding at a Museum? 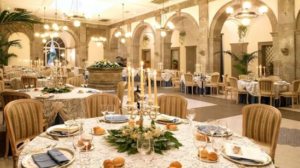 For one of our 20 Luxury Wedding Venues in Italy perhaps you could consider the Museo Correale Di Terranova, an 18th century Villa with gorgeous gardens and bonus- it holds some of the greatest Neapolitan paintings. The gorgeous town of Sorrento is extremely beautiful and we trust you will have a memorable wedding here. It is known for all its amazing gardens that make photo opportunities an easy decision. They are so many exclusive villas and palace hotels to choose from to host your wedding reception. They have amazing restaurants that boost a panoramic view of the city. If a wedding is out of the question, make the time to visit this amazing place for your honeymoon. 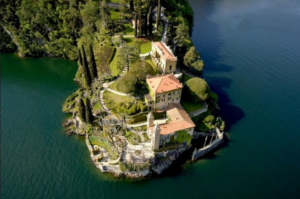 For our next pick for the 20 Luxury Wedding Venues in Italy we venture to Lake Como. 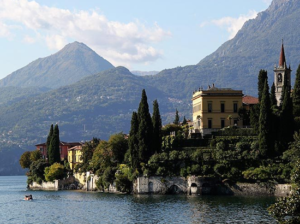 Lake Como is such a hidden oasis that we have picked more than one Luxury Italian wedding destination. Located in the northern part of Italy’s Lombardy Region, this area is positively blooming with beauty, known for it’s up scale resorts, stunning scenery located near the Alps. They are so many amazing resorts to choose from in the area and our first absolute favourite is the Villa Cipressi. 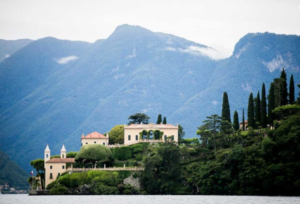 The Villa Cipressi is known for the amazing view of the lake for Luxury Wedding Venues in Italy. It boasts a secluded terrace which is perfect for an intimate ceremony. You have the choice of having an indoor or outdoor reception which is fantastic. The outdoor area is actually on the terrace which over looks the lake and it is covered under a pergola. What makes this villa stand out to us is the beautiful botanical gardens that spread out all around the villa. The perfect venue for a photographer. 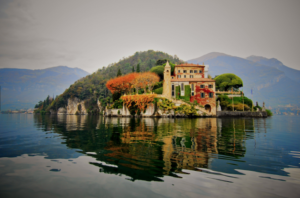 Continuing our Lake Como picks, Villa del Balbianello. 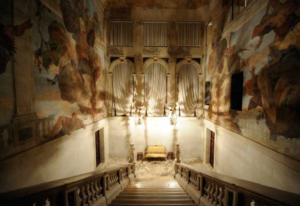 This Luxury Italian wedding venue seems to be something from a fairytale. How did the producers of Game of Thrones not know about this hidden floating paradise? It is the perfect large scale impeccable Italian wedding villa venue if your looking for the perfect hideaway venue, away from prying eyes, private yet utterly swoon-worthy. Sarah Haywood, is a sought after luxury wedding planning expert. She plans wedding around the world for small affairs to grand state of the art events. Elisa Mocci Events is also another luxury wedding planner. Visit here and read about another couple who married in Italy and the process involved. 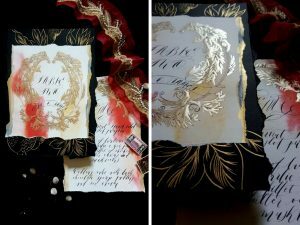 How about some Luxury Wedding Stationery? You simply must visit our portfolio and indulge yourself in your very own, custom designed hand painted stationery. Why not? We took you on a tour around Italy to pick out your favourite chic destination wedding location. Which of these venues would you choose? Did we forget your favourite location? Please leave a comment and tell me what your favourite Luxury Wedding Venue in Italy or anywhere else is?